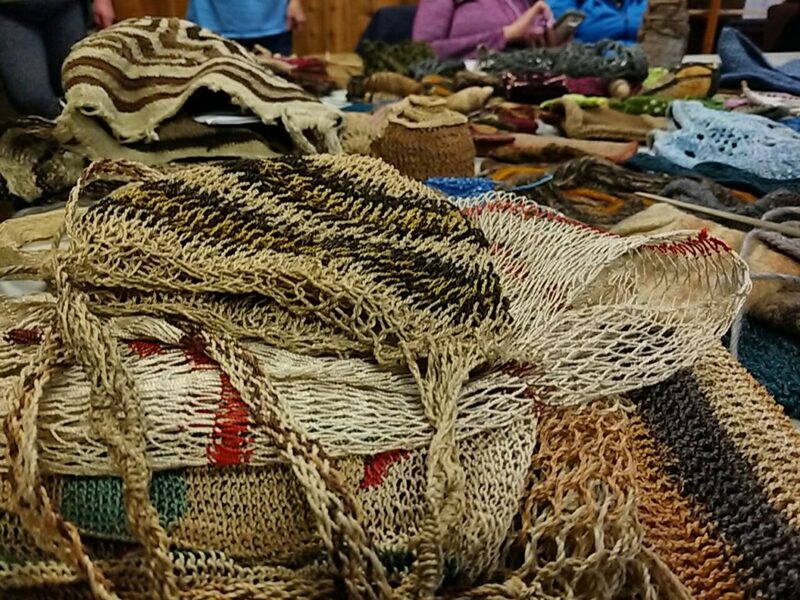 At the Northwest Basket Weavers winter retreat, I had the pleasure of seeing some looped bags collected by other people. This often happens when I give a lecture. I’m always grateful when people share their finds with me and allow me to share them with you — even when I lose sleep trying to figure them out. Sharle Osborne brought several lovely bags to show me, including this one. Its size, shape and stiffness at first had me thinking it might have been a camel muzzle, like this one from the Pitt River Museum. Except this bag has a divider. That, coupled with the length of the strap, lead me to believe it’s more likely a neck pouch. 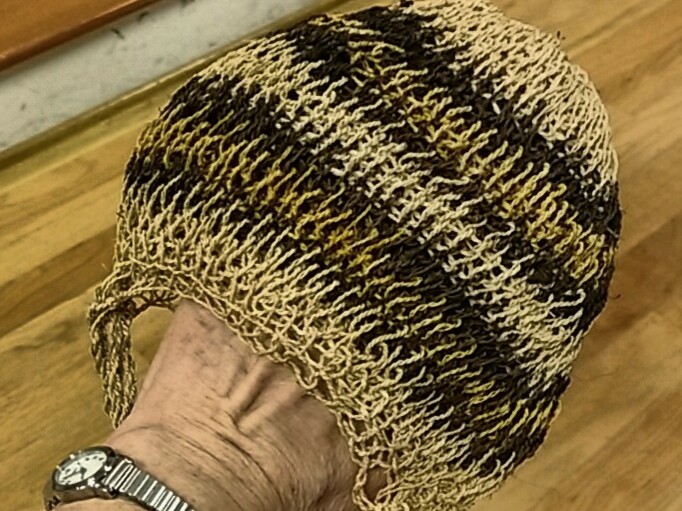 A very cool bush string twisted cordage neck pouch! 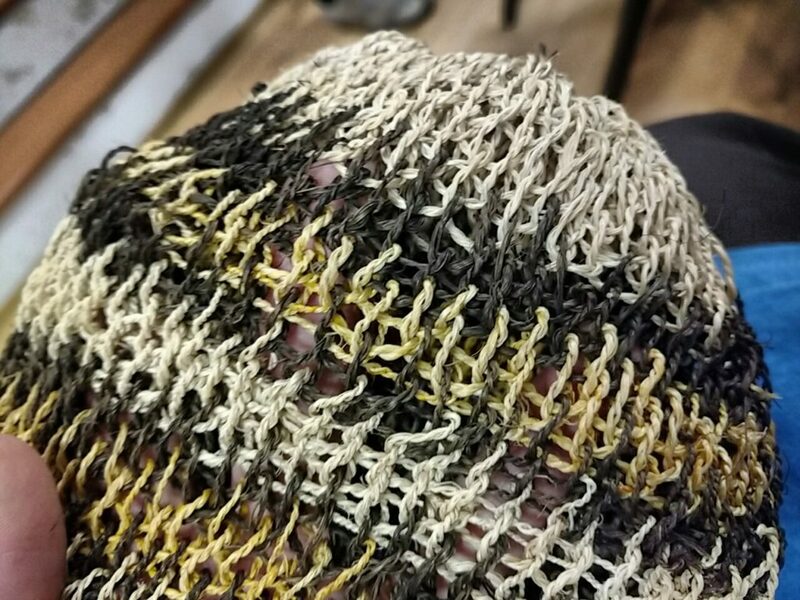 Take a closer look at the structure of this bag. First, new stitches are worked into stitches (rather than on the lags) of the previous row. 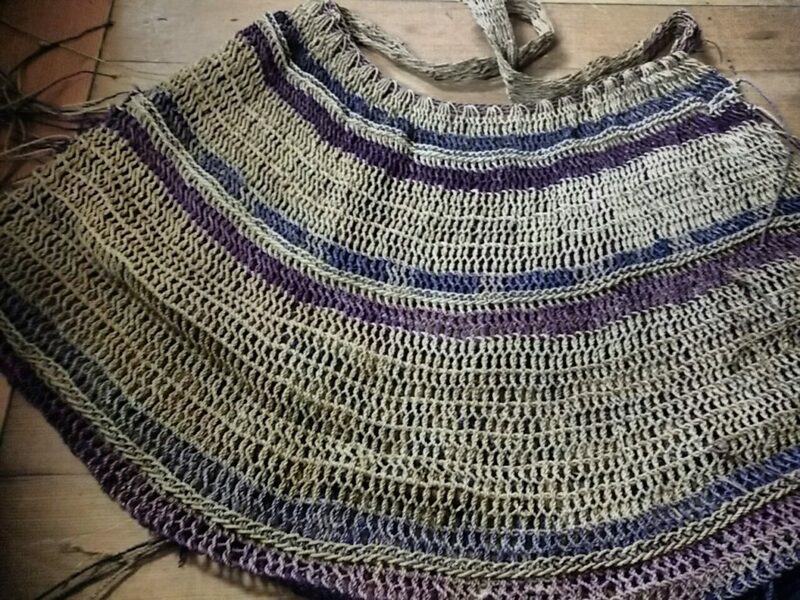 Or, rather, rows: In this bag, new stitches are worked into the stitch of the third row back. 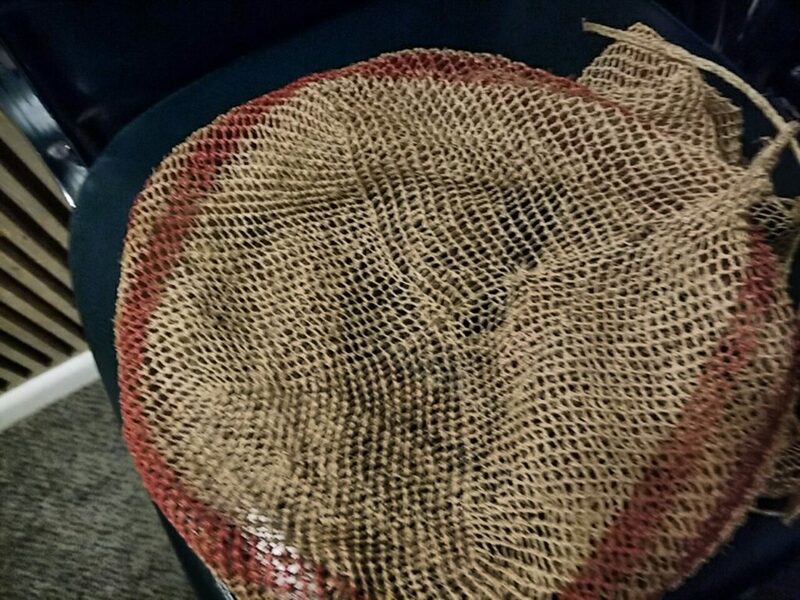 Two other bags I saw at the event (from two different people) were worked into stitches rather than on lags. Note how different the structure in the bag above looks when working just into the previous row versus three rows back in the neck pouch. One of the bags Kay Harradine brought was this fine bilum. The color in the photo does not do justice to the bag. Like the neck pouch, this one gave me a lot to ponder. Here’s the back of that bag. When I got home, I did a bit of internet sleuthing. I believe this bilum style is from Madang area of Papua New Guinea. 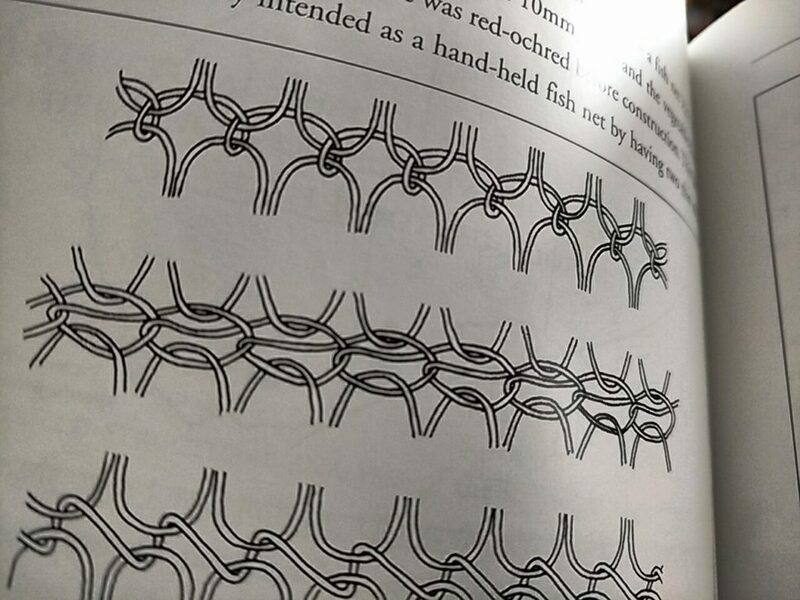 What really caught my attention, though, was how rows of Figure 8 looping were joined by insertion-stitch-style looping. 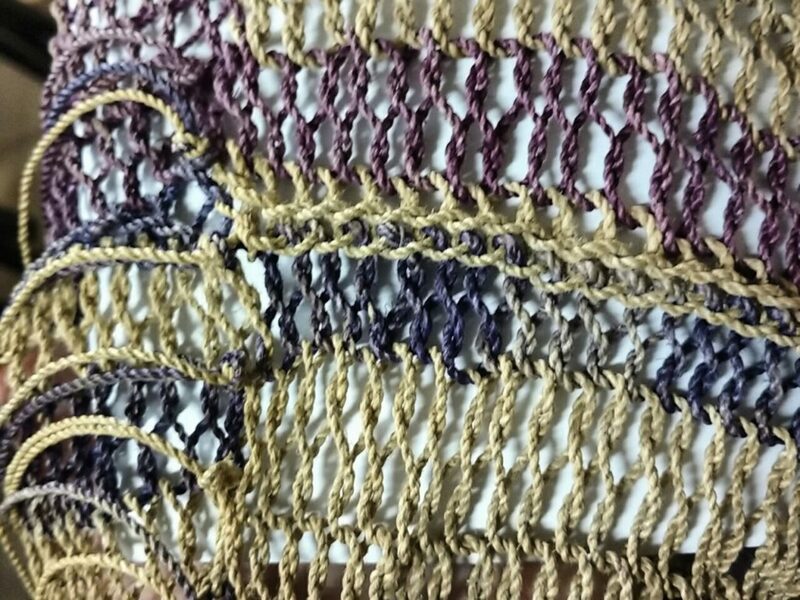 Look closely at the undyed stitches that join what look like blue and purple rows in the top third of this picture (colors are not true). When I got home, I pulled out my copy of The Maker’s Hand by Peter Collingwood looking for examples of joins for live edges. 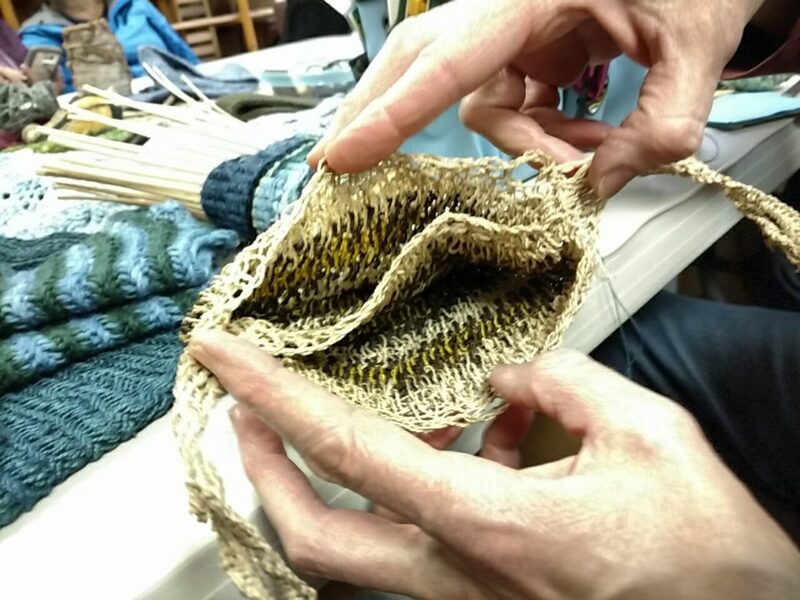 I think this is something I’ll have to play with in several different types of fiber. 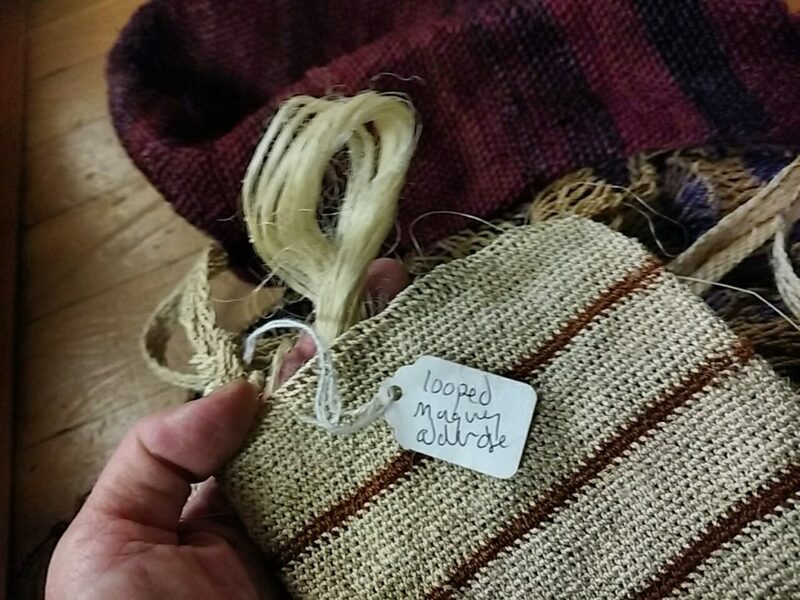 Another bag from Kay, looped from maguey fiber, was labeled with the natural dye used for the brown — alder. 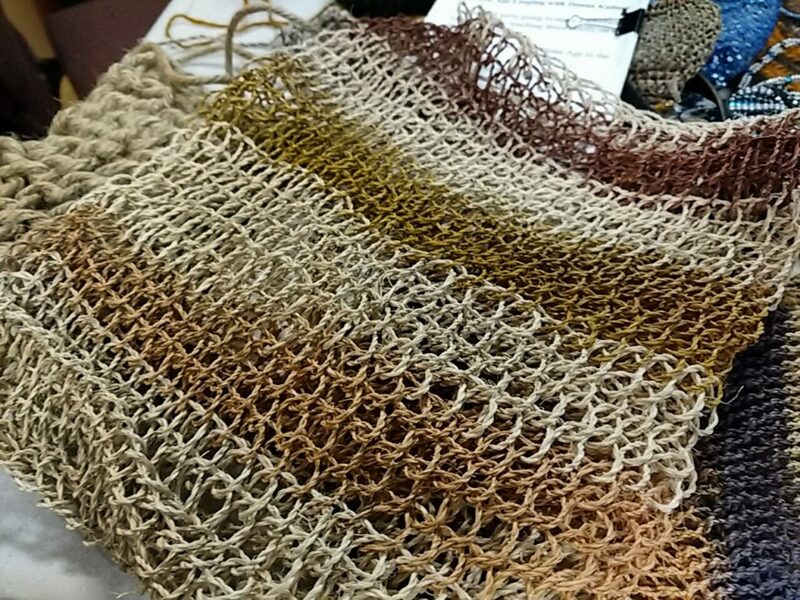 Clearly, I need to make alder a focus for more of my upcoming natural dye experiments. I saw more cool bags than I had time to study. 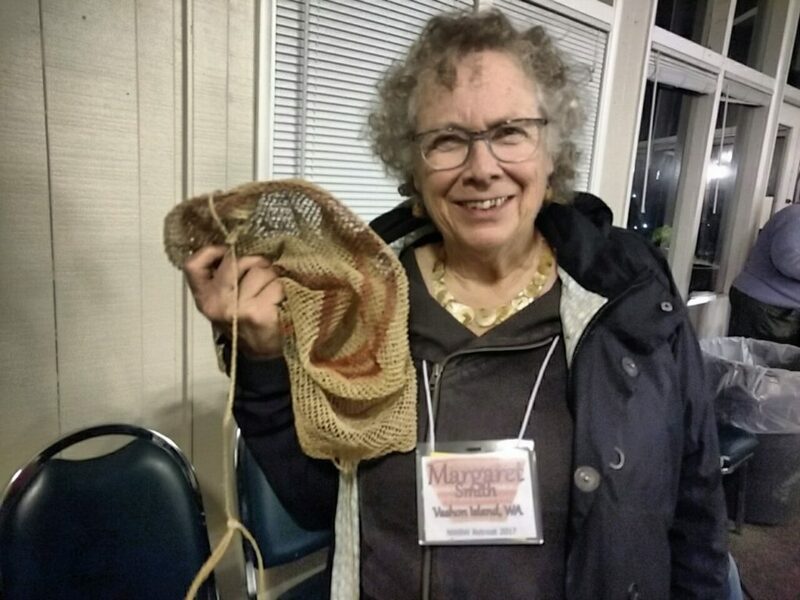 This is one that Margaret Smith brought to show me. It was late in the day, dark and my eyes were tired. I suspected at the time that the bag was linked rather than looped. This post and this video have me halfway convinced that’s true, but honestly I can’t say one way or the other. I do know I was tired, because I took a picture of the base but none of the rim. I did remember to get a picture of this bag with its owner. I wish I had remembered to get pictures of Sharle and Kay with their bags, too. 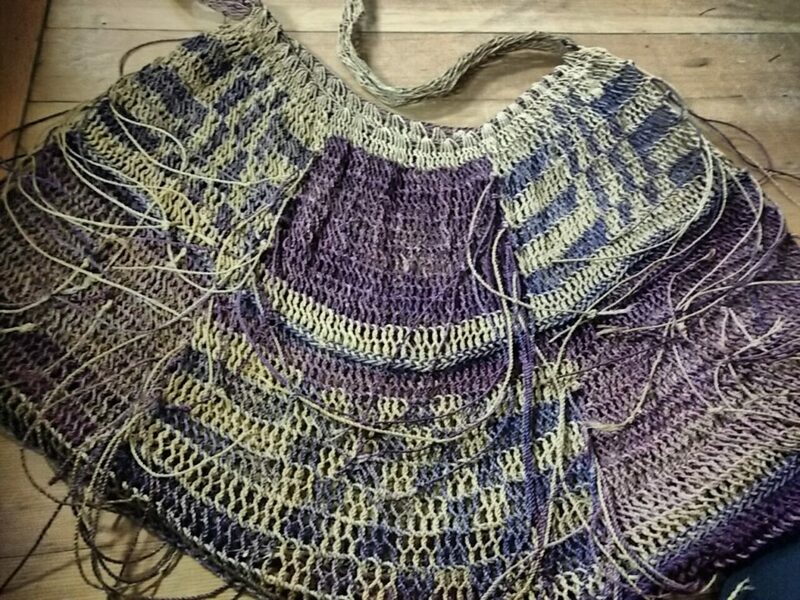 Thank you to all of you for bringing bags to show, and especially to Sharle for leaving bags from her collection in my classroom so students in my workshops could see them! Dear Donna. Thanks so much for your post and good information. String from all the varieties of fibre that we can think of is my passion. Anything Baggie delights my heart. This ancient art continues to be a wonder. Thank you for your work. I’m a bag lover, too, Bev! Thanks for reading!